I sometimes mention how the old ways are pretty much alive and well in my home country of Sweden. It is more evident than ever at this time a year - we close most of the country down to go celebrate the summer solstice. When I was a little girl we did it on the actual day of the summer solstice, but I think we lost too much productivity, so nowadays it's always celebrated on a Friday. In Sweden, Jul (the Christmas holiday with a good portion of old norse activities), and Midsommar (the summer solstice) are the two biggest holidays. We have a really long winter, so the big summer holiday is popular. Today, people all over the country are celebrating with food, flowers, and peculiar dances. One of the most popular is "Små Grodorna" (The little frogs) which is accompanied by both children and adults froghopping around the Midsommarstång. Both women and men like to dress up in traditional dresses. 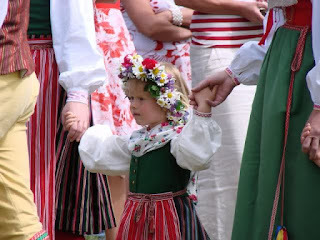 There is a "Sweden dress," but most villages also has a unique style. Many people decorate their houses with flowers and birches, and even the cars get their fair share of flowers and leaves. 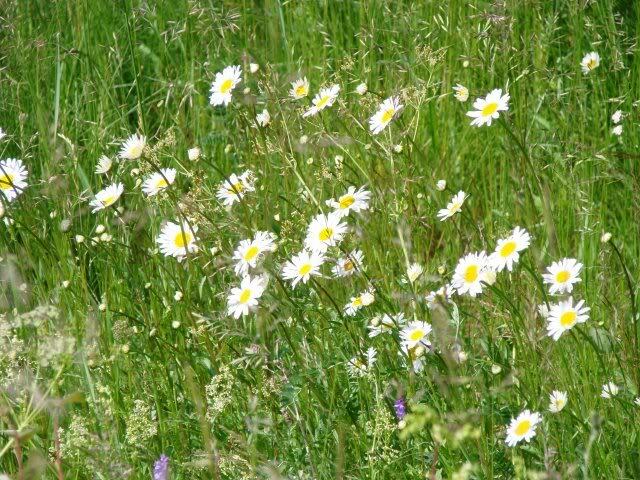 There are many myths surrounding the Midsummer night. If you pick seven different kinds of flowers (it's supposed to be certain kinds of flowers) and put them under your pillow, you allegedly dream of the love of your life. It's also possible to see the fairies dance, and possibly to see Näcken sitting in a river, playing violin, trying to lure maidens to come into the river and drown. If they do, they'll belong to him forever. 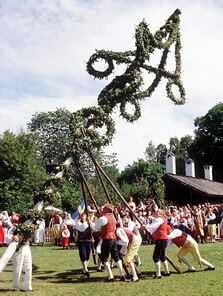 The midsummerpole is a flagpole or taller dressed up with leaves and flowers. Every village have their own take on what it's supposed to look like. Getting it up can be quite an ordeal. Eveyone watches and cheers. Swedes abroad take Midsummer with us when we leave. In my area, the Scandinavian society of Sarasota celebrate Midsummer each year. The IKEA restaurants provide Swedes living abroad with a traditional Swedish midsummer buffet. It's not the same as doing it at home, but a pretty good substitute. That is so neat, Maria! :D I wish you a very happy Midsummer! Do you have your own midsummerpole at your home?? Reminds me of traveling with my parents to all the different countries and seeing all the traditions and such. We tend to forget how interesting life is beyond our own borders or maybe even as far as across the street. interesting Maria and brought back memories of our time in Scandinavia. I always remember a Swedish friend wearing national dress to our son's christening in California. Loved your post. As I told you before we had our Maggie for ten months as an exchange student. She is from Malmo and brought so many of the Swedish customs to our lives. Love that flagpole - a lot of work, but sure looks like fun.